At rental check-out all renters are given a brief orientation on driving the vehicles and how to monitor fluid levels and gauges. A check sheet is also reviewed with the renter for all gear and operations on board and any pre-existing dents to the vehicle are noted. No Smoking is permitted inside the vehicle at any time. All vehicles are based on a 24 hour rental, meaning return time is the same hour in which you departed. On the return date, we charge $40 per hour for every hour late up to 2 hours. After 2 hours we charge 1.5 day’s rental rate. We give a 15 minute grace period at the scheduled return time. Vancouver Westy Rentals is not responsible for any costs incurred due to changing travel plans because of any issues including vehicle breakdowns. We detail each van in between rentals, but an excessively dirty van will incur an additional $150 cleaning fee. This will include any smoking odors. All vehicles depart with a full tank of fuel and are to be returned with a full tank of fuel. Any vehicle not dropped off refueled will be charged for the fuel accordingly with an administration fee. A 25% deposit is required for all reservations. Once the deposit is received your rental dates are confirmed. Full payment is due upon vehicle pick-up. Cancellations must be made via written request. If cancellation is before 60 days of your departure date, the deposit paid is refunded less $200. If cancellation is less than 30 days of your departure date or a no show on your departure date, no portion of the deposit is refunded. Any changes in reducing the reserved dates within 60 days of your departure date, are non refundable. Excessive Cleaning required including from smoke odors. The Security Deposit will be returned less any charges if applicable, in the same format it was received. (I.e. if cash received as deposit it will be returned in cash, if credit card was used as deposit will be credited back on your credit card). We try to make every effort to return the security deposit at time of vehicle return, however we reserve the right to return the security deposit up to 3 days after vehicle rental returned. All drivers must be 25 years old or older. Auto Insurance is required on our rentals and is purchased through Vancouver Westy Rentals. Auto Insurance is charged at $22 per 24 hour rental day. All drivers listed on the Rental Contact must have a valid driver’s license. A copy of these licenses is taken at rental pick-up. In the event of an accident, you must contact us immediately . We will provide assistance. 24 hour roadside assistance is included with your rental. Note that the 24 hour roadside assistance is limited to accessible roads and areas. If you choose to explore more remote areas, you do so at your own risk and are responsible for costs associated with assistance. If your vehicle breaks down with a simple repair, we try to have it repaired as quickly as possible to get you back on the road. If the issue is not deemed to be a simple repair, Vancouver Westy Rentals will attempt to provide a back-up vehicle. If a back-up vehicle is not available and your vehicle is not repairable in a reasonable window of time (generally speaking, 24 hours), Vancouver Westy Rentals will refund the remaining days of your rental fees. Vancouver Westy Rentals will not be responsible for additional costs associated to adjusting your plans in the event your vehicle is not repairable for the remainder of your rental. If you are outside of the prescribed area, or are deemed to be on a non-approved road, all costs associated with towing, repair shall be borne by the renter. Vancouver Westy Rentals is the sole determinant of non-approved roads or other unapproved use of the vehicle. Shoulders and unapproved campsites are generally non-approved and “use at your own risk”. Our vans come with additional camping equipment – both fixed within the vehicle and supplied as part of our service. In the event one of these systems fails, we reserve the right to not repair during your rental or offer a replacement van. Vancouver Westy Rentals is not responsible for any damages, inconveniences, or costs caused by late arrivals under any circumstances. All person’s named in the rental party are responsible for all of their personal items left in or around the Eurovan at all times during the rental. Any theft, loss or damage of any and all personal items of the Rental Party are not are not the responsibility of Vancouver Westy Rentals. The Rental Party will hold harmless Vancouver Westy Rentals for any and all liability issues or personal injuries related to the rental of a Eurovan, its use and operation thereof. Vancouver Westy Rentals is not responsible for any loss, injury, or damage to person or property from any equipment rented from Vancouver Westy Rentals including, but not limited to, the vehicle rental. Upon receipt of your deposit, all Terms and Conditions stated herein are binding, as well the the Terms and Conditions that are attached to the deposit invoice issued by Vancouver Westy Rentals to the Renter. An additional contract will be required to be signed in conjunction with these Terms and Conditions at pick-up of vehicle. We do not allow smoking inside the vehicles. All travel routes must be approved by Vancouver Westy Rentals to ensure they are in our prescribed area, not on non-approved roads and not being used as unauthorized use of vehicle. We cannot be held responsible for making arrangements or guaranteeing the quality of our travel tips. 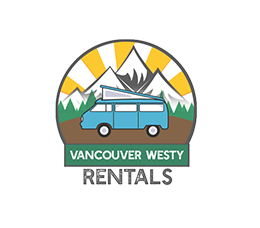 Vancouver Westy Rentals is not responsible for lodging, parking, camping or similar aspects of your trip.